I recently purchased a Grizzly G3155 surface grinder that did not come "ready to use". I need a hub for the grinding wheels, a wheel dresser, and some wheels. I may also need a wheel balancer. I do not know a lot about grinding. Starting off, do I want one rough wheel and one finishing wheel? What grits should I go with? I know a diamond dresser is necessary. Do I need a wheel balancer or should I be OK with a good quality Norton wheel or similar? My go to wheels are a 46H and a 60i. I haven't needed a wheel balancer ever. Dressing diamond is a must, most make their own holder. Make sure you have the proper dust collection in place before you ever dress a wheel. Always use the cardboard blotters, one on each side of the wheel. Buy lots of hubs, but make sure you purchase the proper "hand" for your grinder. Most grinders use LH threaded hubs but there are some that use RH. Pretty easy to build a wheel balancer, just look at some photos of them or visit you tube. If your dust collection is not top notch wear a respirator. For wheels I like porous wheels, they don't load up like tight grain wheels. I also like soft wheels, going against conventional wisdom of soft for hard metal and and hard for soft metal. If you want to do form work you might want some high grit wheels. I can not speak for others but when I started out grinding my skill set improved dramatically when I quit grinding dry and started using flood coolant. I much prefer flood coolant to mist for grinding, cuts down on dust, keeps part temperature stable and has cut down the tendency to burn the part by about 90+ % in my case. You can watch you tube videos and get a decent education on grinding especially the ones from Suburban tool. You will find that with practice you can open up the wheel with a roughing dress, then redress with lighter dress and close the wheel down a bit for a smoother finish. Switching wheels is time consuming IMO, if you can figure out how to rough and finish with one wheel you are miles ahead. I have gotten some pretty nice no name USA made wheels that after dressing serve me just as well as name brand wheels. Also a lot of name brand wheels on ebay at decent prices. Thanks for the advice ya'll. The grinder originally came with a flood coolant pump and tank, so it has the plumbing and connection for a flood coolant motor. The coolant tank/pump were not included with this, but I can easily add one. I'll have to look into it. What hubs do ya'll use? Are they unique to each grinder spindle? The replacement one from Grizzly is about $55. I could make my own, since the wheels will be dressed on installation anyways. Not too sure how wheel mounting works. I have my nice mill and lathe in another walled off section but I do have some other equipment in the same area as the grinder. Should I run dust collection at all times when running the grinder? I was looking at getting one of the grizzly floor units at ~1 HP with a 3 micron filter. Could split duty between the grinder and sand blaster that way too. In grind shops they run ventilation to grinder room and individual exhaust ports at each machine (usually). If you run flood coolant, the dust is cut down considerably. Forgetting how abrasive the dust is to other machines, its my health that most concerns me. I am sensitive to dust , smoke, etc. I rarely operate grinder for more than half hour to hour at a time and wear a mask, run coolant most of time and use a dust collector with fine filter. Sadly my grinder shares room with other tools. I leave room for hour after grinding, let dust settle before returning unmasked. I can see no dust on other machines but I can feel it in my lungs if I am in room shortly after grinding with no mask on. You could not pay me to grind carbide or cobalt without mask on. My grinder,Chevalier 618SP is different than yours, likely has different hubs but the general arrangement is the same. Hubs for 55 are a bargain, mine are 85 or 90. That grizzly air filter that runs about a grand looks nice, I probably ought to put it on wish list. Do not make your own hubs unless of course you are an accomplished ID/OD grinder hand with access to a machine you haven't mentioned. Replacement grinder spindles aren't cheap, no sense in messing up the taper with home brewed adapters. If you didn't get them with the machine you're also going to need a hub puller and a set of hub wrenches. I don't/won't wet grind on my machine (KO Lee 6x18") for two reasons. First, though it cuts down on dust considerably it also adds mist to the air. If I can smell it, I'm breathing it. Second, my dust collection system takes care of all the dry particles but adding oily mist would muck the filters up pretty quiclky. I don't want to add a mist collector to the system too. For the type of grinding I do a cold gun works fine when I'm worried about heat. I have nothing against others using coolant, I just don't need it. $55 for a new hub isn't too bad. I've paid nearly as much for used ones on Ebay. 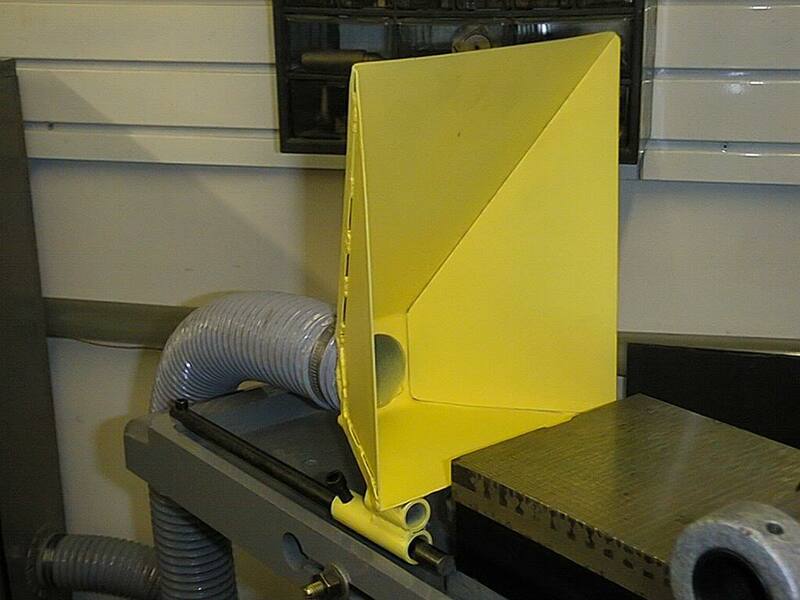 Photo of the dust collector chute I made for mine a very long time ago. You'll want a bright color so you can see the gap between the bottom of the wheel and the top of the part as you 're feeding the wheel down. I just looked up your grinder on Grizzly site, did you get a magnetic chuck? No viewable manual on the Grizzly site. That is odd... 24 grit wheel that comes with the grinder also seems odd. Many or most surface grinders use adapters (wheel hubs) that have a spindle taper of 3 inches per foot, 1 inch diameter on the big end. The wheel size is 1 1/4" on the I. D. Sopko lists the most common one as model 200, (00200). There are many variations of wheel adapters, all expensive, some even more so. There are many other styles, however, and yours may very well be different. Compare the drawings with what you have. I looked on Grizzly and couldn't find wheel hubs. Got a link? Yes, it came with the magnetic chuck. The people I bought I bought it from didn't use it though, they had their own jig and were using a homemade hub to mount a diamond, cone style disc. Maybe just to sharpen planer planes? The chuck is from down by the coast so its fairly rusty. I'll have to clean it up and grind it in. I had found the hub via the parts list, Grizzly PN P3104035, shows at $50, but no drawing or picture available. The hubs that mount to the grinding wheel should just mount directly to the spindle taper right? Would it be worth finding the appropriate one from wmsopko based on measurements of the spindle versus getting the Grizzly one? The "hubs" are properly called "adapters", and yes, they are the sole interface between wheel and spindle, at least on my grinder and others I have seen. Again, yours may be different, so I do not know for sure. The Grizzly site shows that your grinder uses 8" wheels with up to 3/4" thickness. I have seen advice to only use adapters with flanges at least 1/3 the diameter of the wheel for safety reasons. The 200 series adapters I am using on my grinder, which uses 7" wheels, and many, many others use as well, have 2 1/4" O.D flanges. That is a bit short of the 1/3 recommendation. Your grinder, using 8" wheels, may be better off with wider flange adapters. I am fairly new at this myself, and definitely do not know all the answers. Perhaps a real grinder hand could also speak up to help you here on H-M. The Sopko stuff is beautifully made, highly accurate, and priced to match. I have no experience with the Asian equivalents which are also available. I have been able to find the Sopko 200-1 adapters which fit my grinder for $50-55 new with careful searching around. The Asian ones do not seem to be much cheaper, and do not seem to have the washer with the notches in it which help to keep the flange from unscrewing. If your wheel turns clockwise as you face it, you need left hand adapters. I have one right hand adapter, which I only use with the notched washer that makes it more resistant to unscrewing, and I do not use it with normal wheels, only with special tooling that is not so much of a hazard. It might be worth it for you to buy one Grizzly adapter just to see what the maker of the machine thinks is appropriate, and to give you an actual adapter to measure. Don't rush into grinding your chuck if you are new to surface grinding, its not an easy task. When you do grind it in I would highly recommend a open structure wheel, they look like swiss cheese but they sure cut cool and easy. Norton and Radiac both make them as well as no name USA manufacturers whose wheels show up on ebay from time to time. Check out Suburban's youtube video on chuck grinding before you start in on the project. I would get the Grizzly hubs and save some money myself. Ok, given all of that info I'll buy the stock adapter from Grizzly. Doubleeboy - would an open structure wheel function well as a roughing wheel also in that case? I could get one open structure wheel, then a finer grit for finishing. Doubleeboy is correct. Grinding the chuck is probably the most difficult job you can do on a surface grinder if you want to get it right. It is also often done by a complete newbie. If you do not get it right, it will be a continuing nuisance and problem. Leave it alone for a while as you learn how the machine works and you get well practiced with some easy projects. Make sure you have coolant to grind the chuck. Use a coarse, soft, and open wheel like a 46H with an open structure and open dress to grind the chuck, and go easy at it. It will take a long time and it is easy to get in a hurry and botch the job. You will also want to check out the machine and get the geometry and the sliding surfaces in as good of shape as you can before grinding the chuck. If the Grizzly hubs are $50, you can buy new Sopko high quality USA wheels for about that price or a little more if you look around carefully. I would certainly buy one of the Grizzly wheels just to see what is intended for the machine by the manufacturer. I was really surprised that your Grizzly model didn't have auto reciprocation on the table given it's size and coolant capability. The coolant will help tremendously with grinding the chuck in vs the way I was taught in the dark ages. I (and the other grinder hands in the shop) always used Crisco on the chuck and a 46H wheel. It takes a long time to make a single pass on an 18" chuck by hand. I actually need to replace the belt that drives the table also. The one grizzly sells is over $100, I was unable to find anything comparable. It looks like a standard timing belt but has a non standard length, width, and pitch. I have a couple extra steppers from my mills CNC conversion. I might eventually convert it over to an auto feed. Would just have to rigup an adapter to connect to the pulley and setup some limit switches. I don't actually have the coolant tank or pump. It was probably misplaced by the previous owner(s) in the past. It does have all the splash covers and drains though, and an electrical bulkhead for running the pump. I might make a simple setup out of a 5 gallon bucket and harbor freight submersible pump. I will definitely hold off on grinding the chuck. I will probably experiment with just getting good surface finish on some external rifle parts, stuff that isn't critical with regards to dimension/parallelism. Be apprised that if you buy a pump and reservoir set up for flood coolant to stay far , far away from that $200 set up Grizzly sells, its near worthless for surface grinding, pump is weak, does not have adequate filters on it, the magnet that holds nozzle is a weak excuse. It will work but barely. I decided to save money when I bought my new Chevalier SP, the coolant was very expensive option. Live and learn, I spent 200 on the Grizzly and I would say its really made for a bench top mill or lathe, it does not have the oomph to pump up to SG when column is up high. So just incase you were going to go this way, take my experience as a caution. Flood coolant is great , but inadequate pressure makes the mess and hassle not work it. If you do go flood, take off your surround and remount it using lots of RTV sealant, the factory set ups do not come leak proof. I agree with Holescreek about mist in the air, you can minimize it by making sure your coolant hits the surface of work infront of wheel, not hitting the spinning wheel, that alone will cut down mist dramatically, but to pull that off successfully you need to fiddle with your nozzle line on a regular basis with one hand and if you are really cooking on a manual machine both hands are pretty busy moving table and dropping the column. The Chevalier system I now have has two nozzles, I like to set them up so their spray stream crosses each other infront of wheel contact point, that does not always work pefect if you are advancing crossfeed for every longitudinal pass, but the surface usually stays flooded long enough to work, if not you can fiddle. If you look at Suburban's youtube videos they usually use mist for video demos, but....... they have world class ventilation system, both on the machine and whole room. I will be a happy camper when my grinding skills allow me to grind dry but for now to get the results I want I need to use coolant. Please if you are new to grinding pay attention to safety , its easy to get hypnotized by the motion, and if you have a RPC or dust collection or coolant going it can get noisy. Pretty easy to think you have turned wheel off while infact you did not and its still spinning. I bumped my wheel thinking it was off, 5 months later I am still growing a nail back on one finger, I got off easy but the pain was off the charts for days I dont have first hand experience with the Grizzly but on my machine and a couple others I have been around you can barely tell they are on they are so quiet and smooth. Real easy to get a digit or two dinged up or worse. Don't know what you have for phase converter or if you have 3 phase but if running on RPC try turning extra machines on when you want to get really good surface finish, it makes a substantial difference for me and my RPC is well balanced, wild leg is only off by a few volts. I had trouble with Travers not standing by their web site pricing for the adapters. After I ordered some they told me the price was no longer valid and I needed to pay ~$10.00 more each. I argued back and forth and finally got them to split the difference. It was still cheaper than anybody else's price, so I took it. Still, irked me when they would not honor their current online published prices. I also watched for a while afterwards, and the price never changed on the web site. So, watch out for them... Their customer support, both by phone and by email, was also poor. Just a word of advice about buying initial wheels. You do not get superior finish (necessarily) by using a finer wheel. An old grinder hand once told me he only used 46 grit wheels for over 30 years. I've seen his work, and it was superb. Get used to your initial 46 grit AO wheels first. then try other things later. Changing wheels often can confuse things when you are first starting out. This is a lot of great advice. I'll be rereading this. A small addition to your supplies would be oils and oil cans if you don't already have them. My Reid grinder has over 20 lubrication points, many in awkward positions. When I rebuilt it, many were dry or clogged. I find a small pump can with a flexible spout makes it easier to get oil into all those little oil cups rather than all around them. I use 30 weight non detergent on the ways, gears, and screws. I use #10 spindle oil on the spindle. My 1946 B & S 2L has well over 20 lube points, maybe 30, most of them awkward to get to. For some I use way oil, for the rest I use lubricating oil. The plain bearing precision ground tapered spindle, turning in bronze bearing boxes, has a constant level oiler that uses Velocite #3 spindle oil, ISO 2 (!). It is about the same viscosity as kerosene, and needs to be, spindle to bearing clearance is .000110" (110 millionths.) (edit: 110 millionths is actually .0000110", I left out a zero...) No dirt, grit, lint, or anything else but the special oil allowed in there! A quick word about grind wheel adapters: I have found the WM Sopco technical staff to be very helpful. They probably have fielded inquiries about your grinder model before. Since this is their only biz, the would be great to talk to about getting an adapter. The part you mentioned from grizzly does not include the washer and nut, for instance. Add the extra cost for these and you are close to, if not more than a Sopco adapter FWIW. Best of luck with your new grinder! Once you get some experience you will likely find that you can do a ruff dressing on the wheel and then after you have ground your work close to dimension, redress the same wheel for a fine grind. To see the variety of work that can be done with one wheel is eye opening. You can make a 46 grit wheel behave like a 60 or 80 grit wheel if you dress it correctly. Lots of practice. What works for me is a fast pass taking 3-5 tenths for opening the stone up and truing it. Then after roughing work to near size , retrue wheel for fine work by taking slower passes taking maybe 2 tenths or less off per pass and spark out a couple times after last downfeed. Other more experienced hands might feel differently but this is working for me. One thing I don't think anyone mentioned that you need is a nice hand stone that is very smooth to deburr your parts and magnetic chuck before putting work on chuck. Wipe chuck with hand to feel for burrs, stone em out, recheck with hand. If you do this religiously your chuck will thank you, good habit to get into right from the start. Anytime you have time to kill and want to watch youtube, the Suburban Tool videos are highly recommended. +1 on the Suburban videos - Suburban has 300 grinder hands at peak, and know their stuff. . Try also 'THATLAZYMACHINIST' on utube... He was a shop instructor and includes every detail. Very good for starting out. - Some other youtubers show some questionable or even dangerous practices (such as using the mounted diamond backwards). One thing I don't think anyone mentioned that you need is a nice hand stone that is very smooth to deburr your parts and magnetic chuck before putting work on chuck. I'll have to look into making some down the road. I saw the episode where Stefan Gotteswinter talks about them. I got the hub and belt from grizzly in. The hub has a 1 1/4 in OD for the wheel, and the flange is about 3" OD. So I assume I should look for a wheel that's 8" OD 3/4" thick? When I need another hub I'll measure the taper and get a wmsopko hub. This grizzly one is cheaply made.. If that adapter seems to fit your grinder, then go with it. Usually you can use thinner wheels than the maximum capacity in an adapter, so you can instead fit a half inch or a quarter inch thick wheel in the 3/4" adapter if you so wish, as long as it tightens down on the wheel. I think you should stay with the 3" flanges on your grinder for safest operation. Thought I'd post an update. A 220V VFD, 46 grit Norton wheel, and diamond dresser bit are on their way. I still need to make an arbor to balance the wheel, so I'll do that while the other stuff is in shipping. Since most of my tooling and machines are in a different walled off section of my shop I figure I can get by with a shop vac for now. I'll eventually setup a flood coolant system before I get into "bigger" work like grinding the chuck in. Regarding the magnetic chuck, it sat in an uncontrolled climate in a Galveston shop, so there is significant surface rust and pitting on the top. The bottom surface that mounts to the table seems fine. In order to minimize the wheel wear and grinding time I plan on mounting it to the bridgeport and using a flycutter to cut all the patina/rust off. I'm not going to actually grind it in until I have some experience, as suggested. Any thoughts on this?